Business rules are in beta testing. Access to create business rules is provided by invitation of a Yandex manager. 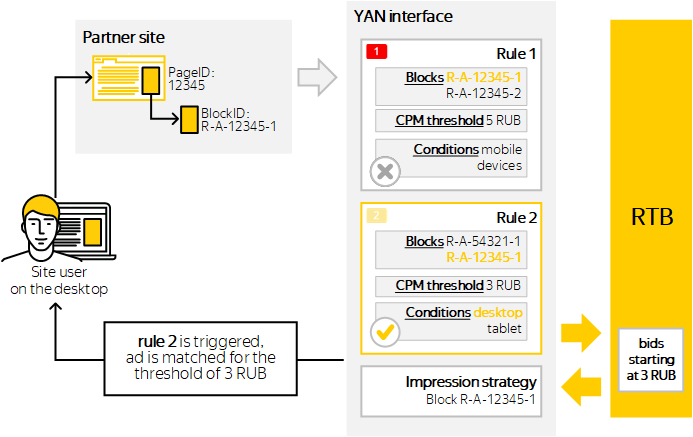 Business rules are a tool for setting a CPM threshold for multiple RTB blocks at once. By configuring targeting based on criteria, you can flexibly segment your audience and serve more expensive ads to more valuable groups of users. Business rules apply to all types of RTB blocks (for sites, mobile apps, and video). Attention. If you set the CPM threshold too high in the rules, you reduce the opportunity to sell traffic at a profit. If you do not specify your own ad code, do not use business rules, because it may reduce the number of impressions on the site and affect your income. In a rule, you set the CPM threshold, select the necessary RTB blocks, and configure targeting criteria. You can add the same block to multiple rules. You set a priority for each rule ( , , ). The process of selecting ads checks whether criteria are met for each rule, starting with the highest priority rule. The CPM threshold is taken from the first rule that the criteria are met for. If no rules are met, the ad is selected based on the CPM threshold specified in the block strategy settings. Go to the Business rules page and click Add a rule. Enter the name of the rule and the CPM threshold. Select the RTB blocks you need from the list. To set up targeting, go to Conditions and select the desired option. You can configure multiple parameters (in other words, create multiple criteria). In order for the rule to be triggered, all the criteria must be met at the same time. Targeting by the user's geographic location. Targeting by the user's device. Targeting by the operating system on the user's device. Targeting by the user's web browser. Targeting by the URL of the page where the user will see the ad block. This condition is met when part of the page URL matches the value of this parameter. The parameter value is case-sensitive. You can add several of these conditions. For example, your site has a section about elephants siteforyandex.com/elephants, and the page URLs in this section contain the name of the breed. If you want to set up targeting for pages about African elephants, add the conditions elephants and african. The rule will be triggered for the page siteforyandex.com/elephants/about-african.html and it won't be triggered for sileforyandex.com/elephants/species-indian.html. Choose targeting values for the platform. Only applies to ADFOX clients. You can add several of these conditions. The rule will be triggered for a platform where all the specified puids are configured. Learn more about working with ADFOX. Click Create. Enable the rule you created. It appears in the Active list with the lowest priority. The Active list contains all the rules that are currently used when selecting ads. The rules are sorted in order of descending priority. Hover over next to the priority and drag the rule to the desired position in the list. When editing a rule, you can change the CPM threshold, conditions, and blocks. To start editing, click the rule name in the list. Set the option to Off. The rule moves to the Inactive list. You can re-enable it at any time. To archive a rule, click . The rule moves to the Archived list.